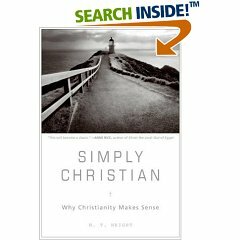 I just recently began reading Simply Christian by N.T. Wright. This may be his best one yet. I will have to take my reading really slow on this one because I will be reading The Formation of Hell all summer for my independent study on the theological doctrine of hell. I will recommend it without finishing yet. This book is worth the read and it’s not too dense like some of Wrights other stuff. It’s really accessible so I recommend it to anyone who is interested in Christianity at any level. If you are a Christian you have to read it, you have no choice… go to the store or on Amazon and order it now! I've heard really good things about that book. I'm looking forward to reading it eventually. Here's a great live interview panel with NT Wright and Anne Rice.